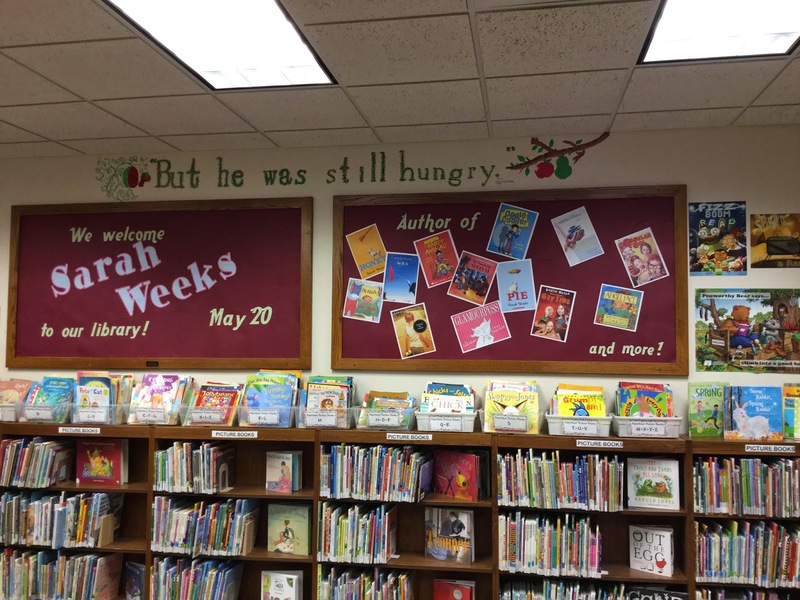 In anticipation of Sarah Week's visit to our library, members of our library and staff decided to decorate to library with all things PIE! 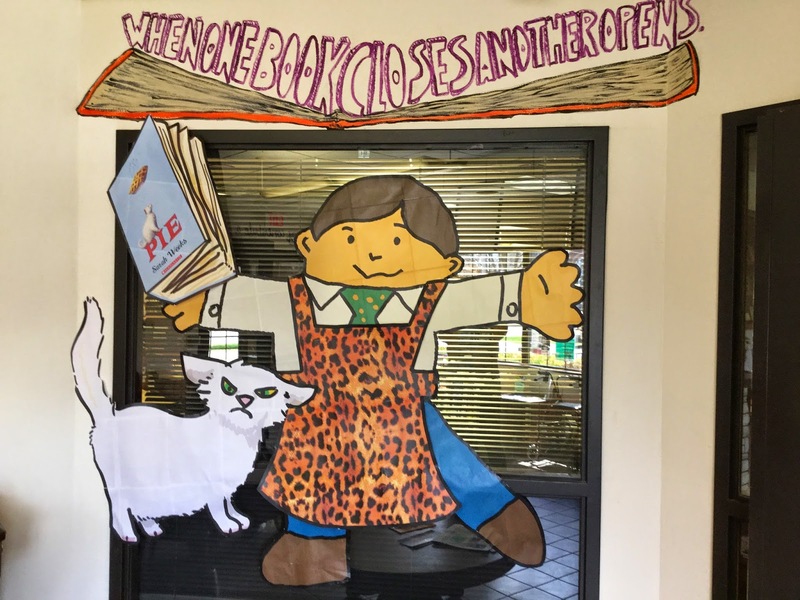 Flat Stanley is a library mascot and he is now dressed up in anticipation of Sarah Weeks' visit. The bulletin board created by Colette Bezio welcomes Sarah Weeks. At family story time on April 29, kids made friendship pie recipes. You can check out other books by this prolific and compassionate author. Go to Infosoup.org (use the drop down to choose author search and type in Weeks, Sarah) and place a hold on any item by using your library card and "pin" and by marking a pick up location. Contact the Muehl Public Library at 833.2725 or sey@mail.owls.lib.wi.us or 436 N. Main Street Seymour, WI if you need any help! Here are some discussion questions from Scholastic.com! Polly’s calling in life is making delicious pies. Do you have a special talent that you love doing like Polly? Charles takes a whiff of a perfume bottle to recall memories of his grandmother. Are there any smells that you associate with people or places you love? Alice remembers how Polly once quoted Henry David Thoreau by saying “Things do not change; we do.” Is there anything in your life that you want to change? How can you make this change? Why do you think Alice sometimes feels that her mother would be happy if she acted differently? Have you ever felt the same way as Alice? How does this make you feel? Why do you think Alice’s mother created the scrapbook detailing Polly’s success? How did this bring Polly and her mother closer together? Miss Gurke, the bodybuilding principal, believes that beauty pageants are insulting to women. What is your opinion? After Polly dies, the entire town starts baking pies in order to win the Blueberry Award. What is the difference between doing something to make others happy and doing something to win an award? Charlie says that he doesn’t like the way it feels to be mad and would rather be happy. Once you are mad, how can you change your mood? Polly once said, “The most important ingredient in a pie is the love that goes into making it.” Have you ever made or received a handmade gift? What makes it so special? Why do you think Polly specified in her will that Alice would write the jingle for the Lardo commercial and her mother would sing it? Here is an interview that Scholastic had with the author of PIE, Sarah Weeks. Book Box Daily: If you had to describe your new book, PIE, in five words, what would they be? Sarah Weeks: Heartfelt. Wholesome. Funny. Sweet. Delicious. BBD: PIE is set in a small, close-knit community in which everyone knows their neighbors. Was this inspired or influenced by a community you’ve lived in, personally? SW: I spent my summers as a child on an island in Lake Michigan. Now I spend my summers in a little town in the Catskill Mountains. So yes, I have had some personal experience with living in a close-knit community. Ipswitch, PA, is a fictional place, and one of the things I loved about creating it was developing the feel of the town and inventing the people who would live there. BBD: In PIE we learn a lot about the pie preferences of a number of the book’s characters. Did their personalities easily dictate their taste in pies? How many different kinds of pie did you bake before settling on the recipes you included in the book? BBD: Lardo the cat is not what most people would consider an “ideal” companion. Was he inspired by any pets you’ve known? SW: Um, I know this will be an unpopular answer with many, but I’m not a cat lover. I’m a dog person. I grew to love Lardo in the course of writing PIE, but I wouldn’t really want to own him. BBD: PIE fits into so many different categories—it’s a story about friendship and family, it’s a story about inspiration, it’s a classic “whodunit” mystery. Are these the types of books you enjoyed reading as a kid? Can you tell us what books were your favorites? SW: I was a huge fan of Freddie the Detective Pig when I was a kid. I’ve always loved mysteries, though I find them kind of hard to write. My editor can attest to the fact that I did a lot of rewriting. Jane Quizzenberry was not the original cat-napper; it was the mayor’s wife. The tricky thing about mysteries is dropping the clues at the right time, and making sure not to leave any loose ends. BBD: The importance of family is a recurring theme in your novels. In each, the central character has a loving (if sometimes complicated) relationship with at least one key relative. Is that a conscious choice on your part, and if so, why? SW: I have to say, it’s not a conscious choice. I’ve always been attracted to things that are surprising. I was very close to both of my parents, and I’m very close to my children. Family is the most important thing in my life, so I guess it’s not surprise that I like to write about it. BBD: The kids you depict in your books tend to be smart, resourceful, and brave (at least eventually!) about confronting their fears. Do you think that you, personally, were such a kid? SW: Brave? Who me? As a kid I was goofy and creative and sensitive. I like to think I’m all of those now too—just with wrinkles. BBD: When you begin writing a novel, which usually comes first—a character or a plotline? SW: I always start with characters. I make them talk to one another and as wacko as it sounds, they often tell me what the story should be about. BBD: How has your background as a singer and songwriter influenced the way you approach your writing? SW: In PIE I got to write song lyrics for Alice to sing. I studied piano and viola and voice in high school and music composition in college. For many years before I became an author I was a singer songwriter, writing for Disney and Sesame Street. I believe in perfect rhymes—no cheating! It was really fun to make up the songs for Alice and also to write the Lardo jingle. BBD: You’ve written more than 50 books for young people—picture books, beginning reader books, chapter books, and middle grade novels—but so far no young adult novels. Do you think you’ll ever write anything specifically aimed at a teen audience? SW: Maybe. If the right idea comes along I’d love to write a book in the voice of a teenage girl. BBD: How (if at all) does your process for writing a chapter book or novel differ from your process for writing a picture book? SW: The process for writing a picture book is completely different from the process of writing a chapter book or novel. For one thing, most of my picture books rhyme. Also, when I write a picture book I’m always thinking about the role the pictures will play in the telling of the story. It can take me several months to write a picture book, but it takes me several years to write a novel. I usually have a couple of things going at the same time, so that I can change it up a little. I might spend the morning working on a serious novel and then switch over to something lighter in the afternoon. BBD: You are one of the esteemed authors who founded Authors Readers Theatre. 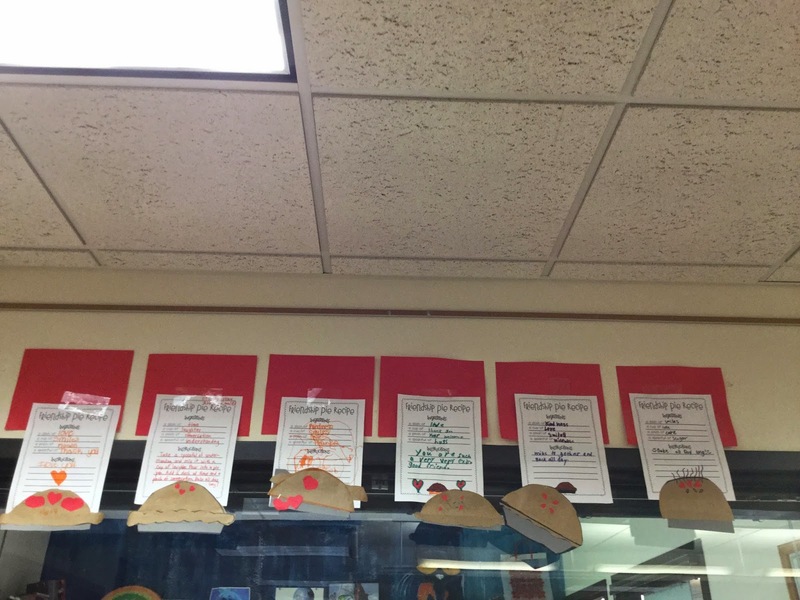 Can you tell us what your group does and how that idea came about? SW: ART was started about six years ago by Avi, Walter Dean Meyers, Sharon Creech, and myself. We love the format of reader’s theatre so much—putting together scripts made up from scenes in our books, rehearsing together, editing together, and then performing at conferences of librarians and teachers. It’s so much fun! The group has expanded and changed over the years to include other wonderful authors such as Brian Selznick, Pam Munoz Ryan, Katherine Patterson, and Bruce Coville to name a few. BBD: Can you share with us an especially memorable question or comment you’ve received from one of your readers? BBD: Finally, what are your top five favorite pies? SW: Blueberry, peach, pumpkin, lemon chess, and chocolate angel pie. The last one is not one of the recipes in the book, but anyone who wants to know how to make it can write to me on my BLOG and I’ll be happy to share the recipe! We’d like to thank Sarah one more time for taking a moment to talk with us. At story time on Monday, April 27, children were introduced to another book by Sarah Weeks called Mac and Cheese. It is about two cats who are very different from each other. Mac is very active and Cheese is very laid back. Still, they like being with each other and when Mac loses his hat it is Cheese to the rescue. This book rhymes and has a good rhythm for reading aloud. The kids liked laughing at Cheese and his grumpiness! What is this Community Book Read about? What is this all about? How can I read the book? This is the FIRST COMMUNITY READ in Seymour, WI under the leadership of Elizabeth Timmins, Library Director at the Muehl Public Library (436 N. Main Street) and in collaboration with many people including the Seymour School District, the Friends of the Muehl Public Library (FMPL), the Muehl Public Library Board of Trustees, our library patrons, our library staff , the Outagamie Waupaca Library System and Sarah Weeks herself! Elizabeth chose PIE because she believes it is a book that appeals across generations and that actually has a similar “feel” as the Seymour community. 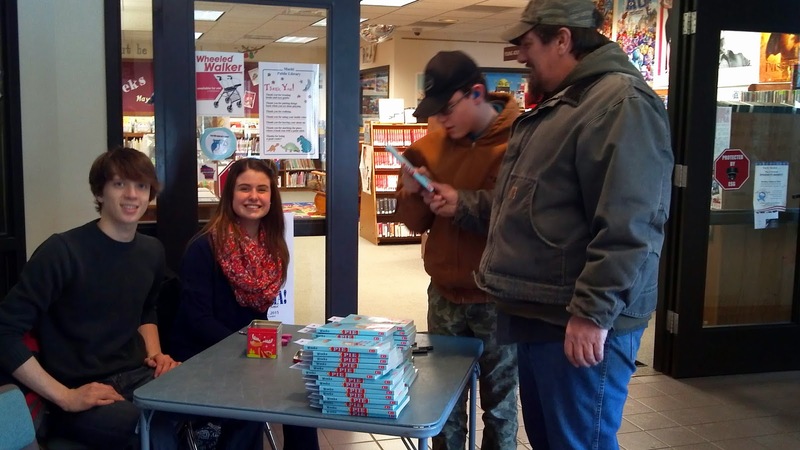 On Friday, February 20, FBLA students Sydney Wilcox and David Michaelson began distribution of copies of the book PIE by Sarah Weeks to the community in the foyer of the library. Eventually 200 copies were handed out and patrons were invited to bring them back and have them signed by the author on May 20. If you would like to read a copy but did not receive one, they are available for check out in Infosoup. There is also an audio version that is delightful! We are getting great feedback on the book! It is short and simple to read but the story is rich and will offer many components for discussion and interaction. Keep reading everyone! Sarah Weeks has written more than fifty picture books and novels for children and young adults including the best selling novels, So B. It and Pie. Two of her most recent contributions are GLAMOURPUSS (a picture book illustrated by David Small) and HONEY, a novel — both published by Scholastic. In addition to writing, Sarah is an adjunct faculty member in the prestigious Writing Program at the New School University in New York City and a founding member of ART, a traveling troupe of authors who perform reader’s theater at conventions and conferences across the country. Born and raised in Ann Arbor, Michigan, she splits her time between her homes in Nyack, NY and Callicoon Center, NY. She is married to a High School history teacher and has two grown sons.